Although the word is probably used much more loosely, an ingot is technically a specific type of gold bar. The word refers to the specific process by which these bars are manufactured - they are produced by pouring molten gold into a mould. The word ‘ingot’ comes from the mould in which the bars are cast. It is this process that differentiates them from other, usually smaller, bars, which are produced by minting or stamping sheets of gold bullion. Ingots are bound to a set of Good Delivery Rules laid out by the London Bullion Market Association (LBMA). As with all other types of bullion bar, gold ingots are required by the LBMA to contain 99.5% pure gold, i.e. 995.0 parts per thousand fine gold. They can come in a variety of sizes, but Good Delivery Bars are required weigh 350-430 troy ounces (11-13kg). This means that 400 oz t ingots contain at least 398 oz t of fine gold. An ingot may also carry certain marks: serial number, refiner’s hallmark, fineness, year of manufacture. How Much is a Good Delivery Bar Worth? 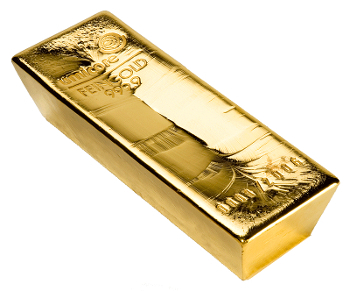 As with all other forms of gold bullion, a Good Delivery Bar does not have a fixed price. 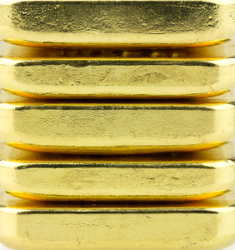 Its value is dependent on its gold content, and the ever-changing gold spot price. To find this you simply have to multiply its gold content by the current spot price, so a 400 oz t ingot, at a time when the spot price is £865/ oz t, would have a bullion value of around £345,000. Why do People Invest in Gold Bars? When it comes to investing our money, there are so many options it is difficult to know which is best. Naturally, many will go for the option that can offer, or claims it can offer the best return on the initial investment. Savings accounts offering a certain interest rate or shares in high-performing companies can appeal to investors, offering a regular income and potential rewards that, at face value, a piece of metal can not provide. However, while banks and businesses are prone to collapse, leaving your investment completely lost, a physical gold bar can not. Buying precious metals offers investors an asset that can not be devalued in the same way as money, through continuous printing of cash. Gold has an intrinsic value that draws investors looking to protect a part of their wealth in an asset whose value won't be lost to inflation or economic collapse. Consequentially, demand for gold will tend to rise in times of crisis when the frailties of other forms of investment are exposed, pushing the value of gold bullion up significantly.